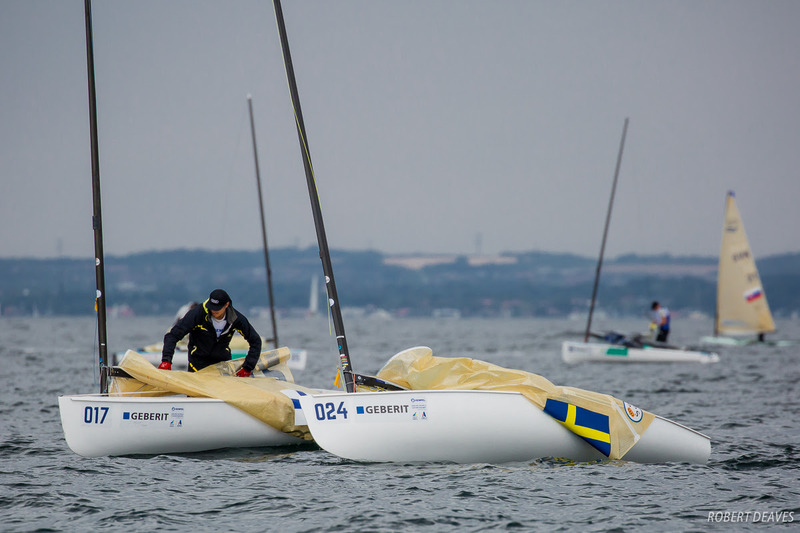 The wind, which has been exceptional so far this week, decided to take a day off, at least on the Finn course, though true to form for Aarhus other areas had just enough wind to get a few races in. There were dark, low clouds all day and moments of light rain. It was still warm but considerably cooler than recently. Overall it was a grey day on the water. The Finns were a long way from shore on Golf course and the wind played games with the race committee as they tried to get a race away. One was even attempted after some new breeze came in late afternoon, and there were hopes of a race, but it was stopped with just minutes to the start gun. Shortly after that, AP over A was raised to abandon racing for the day and the fleet was sent back to shore empty handed. Yesterday the fleet had a reserve day and stayed ashore while the other fleets enjoyed the best wind of the regatta so far, so it is with some irony that they get a day of no racing after a day off. Though today’s forecast was for around 10 knots (at least one of the forecasts) the conditions for Tuesday look slightly more encouraging with the return of the sunshine and warmer temperatures expected.